I’ve recently noticed a worrying trend (if two things is a trend) in web browser user interface design. The latest versions of Internet Explorer and Google’s recently launched Chrome browser have both decided grey out everything in the address bar except the top level domain name (TLD). 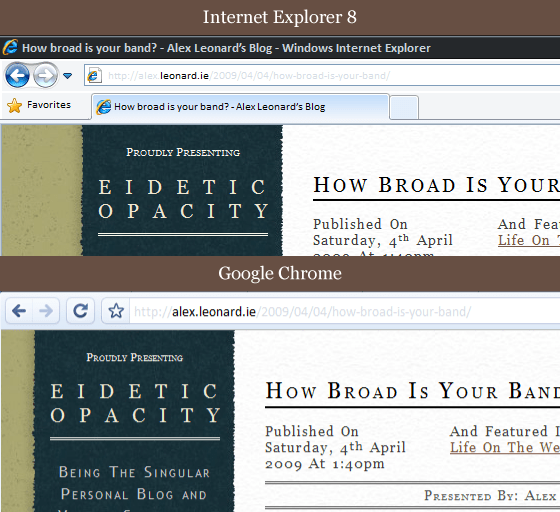 For example, when browsing this page Google Chrome would grey out everything except “alex.leonard.ie”, and IE would grey out everything except “leonard.ie”. Is this progress or change for the sake of it? I find it extremely frustrating to not be able to clearly make out the URL of my current location. I really hope other browsers don’t go down this road, of if they do, they ensure that the greying out of the “less important” parts of the URL is much less drastic. It could of course just be bad colour and contrast settings on my screens, but in theory I’m fully colour corrected with the Datacolor Spyder3. Of course I’m not against new developments and things moving forward. However, for my own purposes this UI change doesn’t work. I can see that for the general user, they probably don’t care what the full URL is, but as a web designer I find that it is important for me to be able to quickly garner information from the URL with one glance at the address bar. There was recently an interesting discussion between Alex Faaborg and Aza Raskin over on Vimeo regarding the question of designing of chromeless browsing. It’s fairly nerdy now, but I will admit I found it to be good listening. Lots of good things mentioned such as the difference between ‘Usability’ and ‘Discoverability’, which shows how easy it is to not even think about what goes into good user interface design. Aza Raskin is Head of User Experience for Mozilla Labs and Alex Faaborg is a User Experience Specialist at the Mozilla Corporation.